Spring Migration are you ready? It’s quickly coming up on that time to head to the beach. Not for the sun or the sand but for the birds. Spring migration can be one of the most exciting times of the year as thousands of birds move throughout the United States. I have spent some time down in Florida over the years enjoying these migrations and each year it’s a little bit different. Since migration is affected by temperature and weather there is never a precise date when it’s going to be the best. The end of March is usually when it starts and goes throughout May. Shorebirds and waterfowl aren’t the only species to be watching for. Going into May smaller birds like warblers move through areas like Lake Michigan which can produce some amazing images. So the question is how do you prep for this? Keep in mind one important element from the get go, no matter where you live there is some form of migration happening. The country is big but birds do fly. While they tend to move along waterways it does vary by species. For instance in Montana we get a big Bald Eagle migration each year. So start by researching your area first. If you plan on going somewhere else study that area and the birds that inhabit it. Go through your gear carefully. If you’re going to the beach be sure to bring a panning plate and a frisbee so you can get down low. Practice your proper long lens technique because if you’re going after birds you’re going to need a long lens. Proper technique means the hand resting on top of the lens barrel, with the eyecup tight against your face. Watch your backgrounds and look for clean images. Most of all be hard on yourself and critique the images. Look at gesture, light and how they tell the story of the subject. Then use that info to push yourself to get better images. If you need more help Cornell Lab of Ornithology and Audubon can yield some more answers. 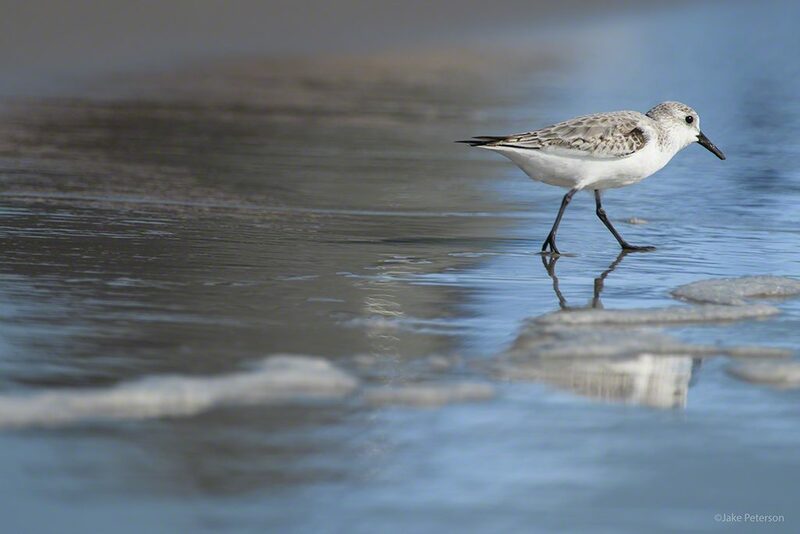 While it is still quite cold up north the annual spring migration has begun in many areas with different species of shorebirds, song birds and raptors moving through North America. Depending on what you are going after while drastically change where you go but this is a good time to start doing your homework so you can get those shots you’ve always wanted. 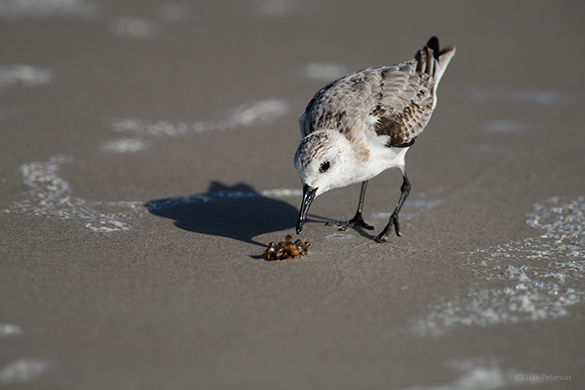 When it comes to shorebirds there are a lot of little things to keep in mind to get “the” shot. Body gesture, composition, having a clean background, the plain of focus and more are all important to a successful bird image. This was taken with the D5 and 600 f/4. While I wasn’t down low I was looking far down the beach in order to get a cleaner background. I was also waited for the wave to come to clean up the beach. 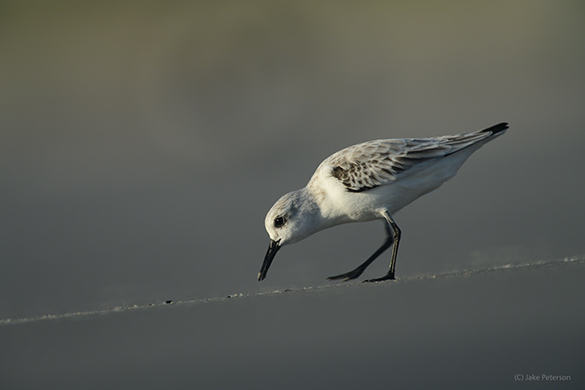 Little details really make a big difference to make this Sanderling pop out. 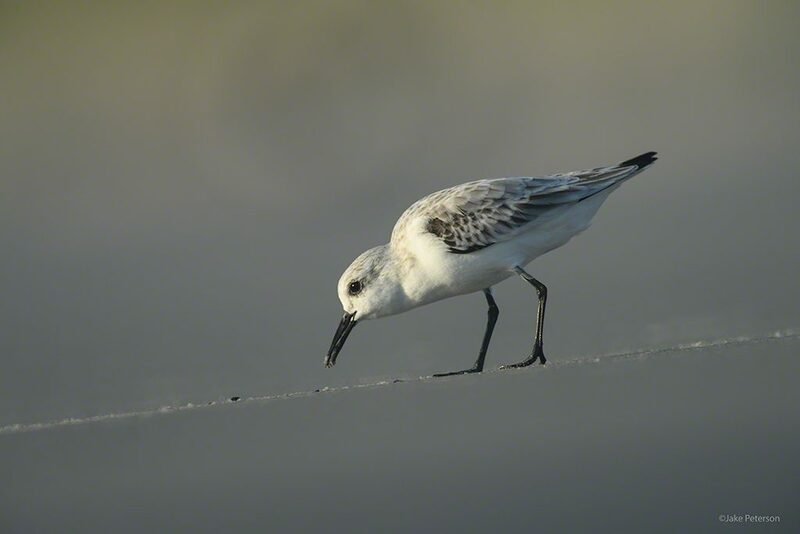 One of the first lessons that we went over in Texas while working with shorebirds is the plain of focus. 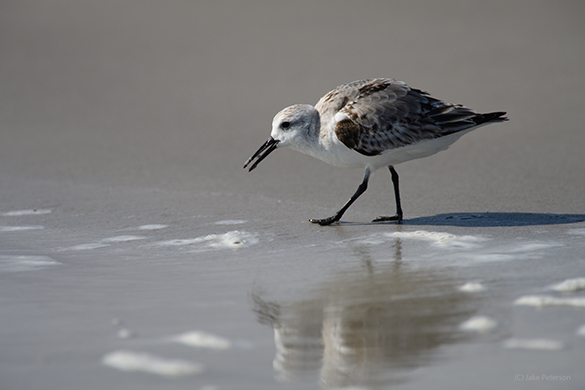 Over half of the images you see out there of shorebirds are taken while using a tripod. By using a tripod you are above the bird and thus looking down on the subject. The result is more information in the foreground and background, as demonstrated below. For the purpose of this lesson try not to focus on the lighting or gesture of the subject. While both of those are important they might make it more confusing to understand this one topic. If you compare the top image and the bottom imagine, the foreground holds the biggest difference. While both backgrounds blur out a lot the foreground holds more information in focus and thus becomes more of a distraction. If you’re working on a beach that has a lot of traffic and debris you want to manage that as best as possible. A panning plate, in a frisbee, on the ground allows you to slide along and pan with the birds creating better images. The results speak for themselves but it is difficult to get used laying in the sand. Most people are uncomfortable with the big lens that close to sand but by being careful and practicing eventually it becomes muscle memory. I’m down in Texas working with Dad and his group photograph migratory shore birds and it’s off to a great start! 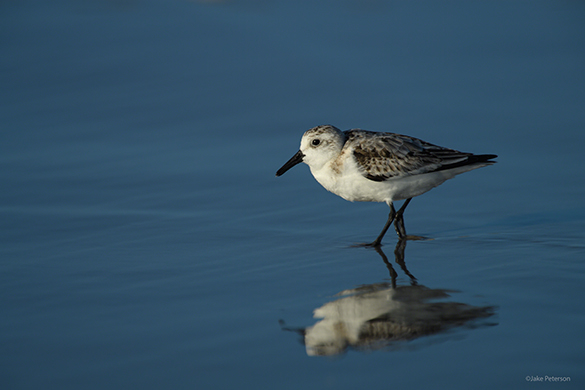 The big hit yesterday was the Sanderling’s. These wicked fast little birds are just cute as can be and are a ton of fun to work with. They migrate down to the Gulf Coast where it’s warmer in the winter. They have a habit of running in with the wave comes in and then chases it as it goes back out eating anything they can find. This one found something interesting in the little bit of the plant matter that washed ashore. Simple click with the D5, 600 f/4 and TC-17EII Teleconverter. I can’t wait to see what today brings.